With a very long-lasting, convincing presence and perceptibility in its scent development, mi2 envelops you like a second skin. Its play of fragrances is illuminating, uplifting, charming, expressive and energizing! The main actor in this play is a magnificent rose scent that speaks of love. A scent impossible to get enough of! In this perfume creation it has a celestial meaning. The rose, known as the queen of flowers, is also associated with a very special angel, the angel Barachiel! He is the angel of blessings and miracles! Coming from the sacred power of the Virgin, „love“ can express itself in the fragrant manifestation of the rose in special moments, and be granted to mankind. With its warm basic notes, mi2 harmonizes the mind. Powdery tones in mi2 unfold elegance. 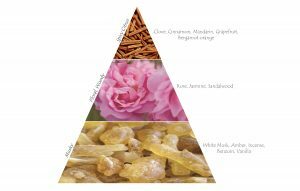 The basic note of subtly resonating holy incense, as well as Siam benzoin, amber, white musk, Madagascar vanilla and sandalwood, gently encase the expressive, exquisite rose reinforced by jasmine. The prelude of hesperidic notes like grapefruit uplifts you immediately. 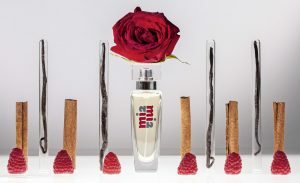 In addition to fruity raspberry, the head note in mi2 discloses a choice, fragrant essence said to bring luck! Since then, the rose has been symbolic of love! Its miraculous scent as an essential oil vibrates with the high frequency of measurable 320 MHz ( megahertz ). In the year 2014 something whimsical happened to me during the summer in the period of 14 days. which did not physically existed since I was neither in contact with rose essence, nor any roses found near me! This event had to be realized first and I was amazed and touched by it. It became clear to me that this was a heavenly presence that was revealed to me in this way and form. in love and also touch you! mi2 is like a heavenly embrace! 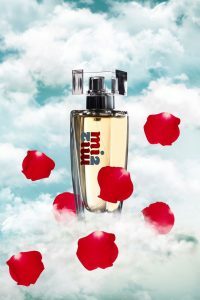 Led by angels, mi2 has been created to inspire a touchability and contact between heaven and earth over the fragrance!